House Speaker Paul Ryan issued a rare statement publicly breaking with the president. Economic analysts warn that a trade dispute sparked by the tariffs could damage communities that backed the president in 2016. As he blitzed through the industrial Midwest as a presidential candidate, Donald Trump pitched himself as the savior of the “forgotten” men and women in communities where factories had been shuttered and jobs were moved overseas. Now, Trump is risking a trade war to fulfill a political promise to the voters who helped put him in the White House. His decision to levy stiff new tariffs on aluminum and steel imports puts him at odds with most of the Republican Party, prominent business groups and even some of his own advisers, who warn that the decision could backfire and slow economic growth in a midterm election year. According to economic analysts, some of the communities that would be hardest hit by a trade standoff could be the same ones the president says he’s aiming to help. Yet those arguments had little resonance with Trump during the fiery battle over tariffs that has played out in the West Wing in recent days. 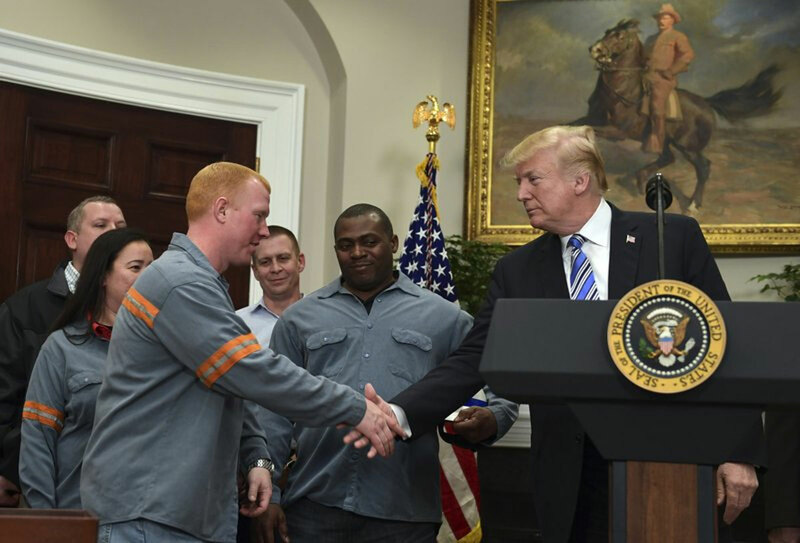 Having overcome the opposition, Trump relished Thursday’s signing ceremony, where he was flanked by steelworkers — some carrying their hard hats — who lavished praise on his decision. Notably, no Republican lawmakers attended the White House event. Current and former White House officials often describe the president as being preoccupied with keeping campaign promises to his loyal supporters, even if those decisions are unpopular with a broader swath of Americans. In public and in private, Trump still speaks frequently of his victories 16 months ago in Democratic-leaning states like Pennsylvania, Wisconsin and Michigan, where working-class white voters helped propel him to victory. He’ll likely need to carry those states again if he hopes to win re-election in 2020. In Pennsylvania, both the Republican and Democratic candidate running in next week’s House special election endorsed the broad outlines of the president’s approach on tariffs during a recent debate. Trump plans to campaign for Republican Rick Saccone on Saturday. However, most GOP lawmakers have balked at Trump’s approach, which includes exemptions for Mexico and Canada and the opportunity for other countries to appeal for a similar reprieve. And like the president, Republicans are making political calculations in doing so. Having made little progress in Congress on several GOP priorities, Republican candidates have been banking on a strong economy and the growing popularity of the party’s tax overhaul to combat a Democratic electorate energized by its disdain for Trump. Republican Sen. Ron Johnson of Wisconsin called the tariffs “a very risky action” that could put agricultural and manufacturing jobs in his state and across the country at risk. House Speaker Paul Ryan, who is also from Wisconsin, issued a rare statement publicly breaking with the president. “I disagree with this action and fear its unintended consequences,” he said. Even before entering politics, Trump the businessman and real estate developer railed against what he viewed as unfair trade practices that left the U.S. economy and American workers vulnerable. Those viewpoints became the centerpiece of his presidential campaign, and he vowed to not only slap tougher tariffs on exports, but also withdraw the United States from multilateral free trade agreements with allies in Asia and North America. Hours before the president signed an executive order implementing the new tariffs, trade ministers from 11 Pacific Rim countries signed a sweeping free trade agreement the U.S. had been part of until Trump withdrew last year. The agreement was negotiated by Democratic President Barack Obama’s administration, but had broad support from GOP leaders who have long backed multilateral free trade pacts. Economic analysts warn that a trade dispute sparked by the tariffs could damage communities that backed the president in 2016. An analysis by Brookings Institution last year showed that areas that voted for Trump are more dependent on exports, which foreign countries could target in retaliation. Exports account for more than half of the local economy in Columbus, Indiana, and 25 percent of Fond du Lac, Wisconsin’s economy. The economic data mattered little Thursday to Dustin Stevens, a superintendent at Century Aluminum Potline in Hawesville, Kentucky, who attended the White House event.